With elegant, cinnamon colored fabric, these drapery panels compliment the beautiful oriental rug in this dining room. I loved the detail of the small silk cording, added to the bottom edge of the valance, with single tassels attached at each point. Coordinating silk and plaid fabric was chosen for the dining room seat cushions, adding just the right touch of pattern for the large scale of this space. Silk cording and tassels were repeated on the edge of the seat cushions for the perfect finishing touch for this interior design project. With details in mind, this interior design project added many elements to this refreshed sunroom! This two chair and ottoman combination in a natural, glossy rattan welcome guests to sit down and relax. Beautiful custom drapery panels are held by one of my favorite corner rod selections that I frequently use in sunroom spaces. The simple yet elegant top-run window treatment for the panels provides just enough fabric to gather softly in the corners. Fabricated custom holdbacks in the same pattern gather the classic striped fabric, presented here in a pretty shade of blue and cream. Highlighting the window frames, the custom drapery color was chosen in just a hint richer than the cushion fabric below. There is a distinct "play on color" here as all of the design elements come together. The fabric for the pillows pulls in some of the blue from the drapery and cushion colors. The seating areas is perfectly situated on a taupe colored rug which is woven with hints of subtle blue and sage colors throughout. The ‘Shagreen’ paint color chosen for sunroom walls sets a beautiful back drop for all of the natural light streaming in through the windows. A go-to favorite color for trim paint is ‘Decorators’ white, which adds a lovely contrast that highlights the wall color. Details make a design come to life. In the world of interior designers, tassels can add a delightful aesthetic to window treatments and custom upholstery. These tassels with beaded trim and silk cording compliment the drapery, to create a beautiful custom look. While a wall of windows can sometimes be a challenge for my clients, it doesn't have to be! I often remind my clients that while natural light is beautiful it can be damaging to furniture and rugs. 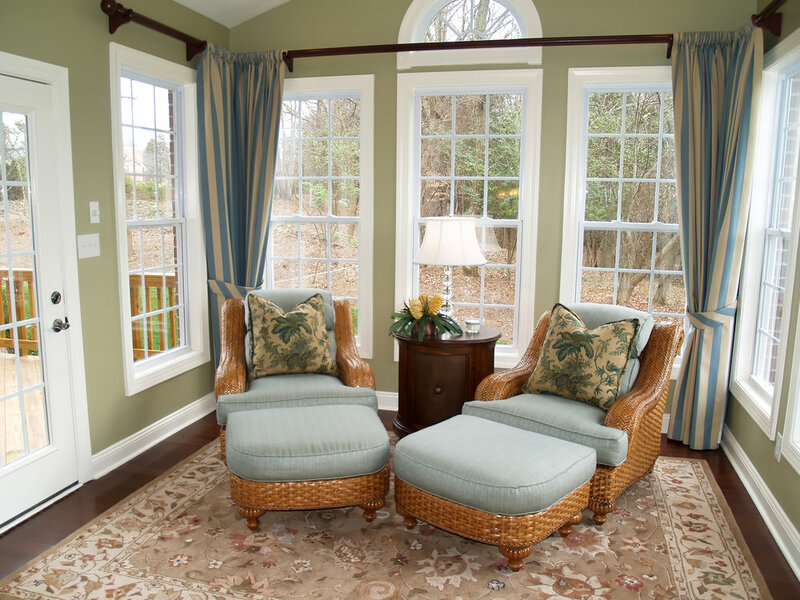 Using window film protection on the windows will save fabrics, floors and rugs from fading. 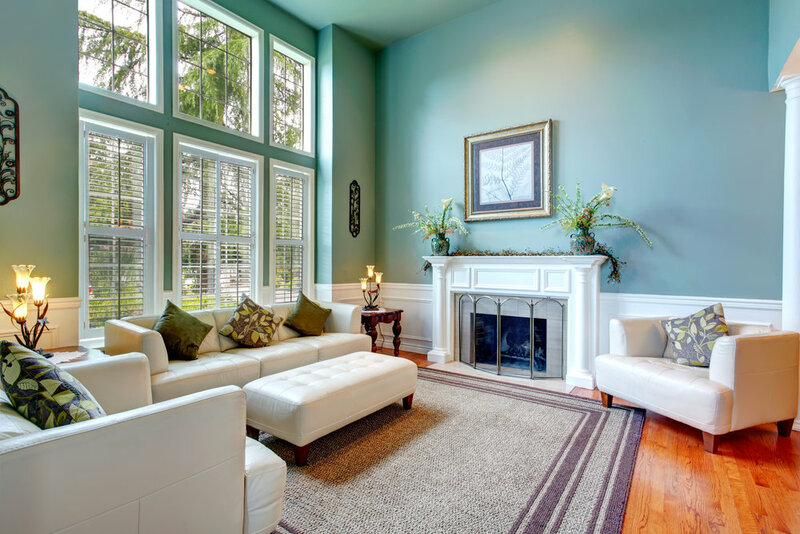 A large wall of windows creates a breathtaking interior design presentation. Shutters are used here on the bottom half only. I often suggest leaving the transom window open to allow as much natural light to enter the room as possible. The green foliage of the trees sets a distinct backdrop of color. I love pulling in the same pallet of colors from outdoors inside, especially on the pillows featured here! A pretty choice in wall color here - Watery Sherwin Williams - adds a glow to a large-scale room. While not too dark, the color palette this choice allows you to use on furniture and rugs is endless. White furniture combined with the lighter window trim provides perfect contrast. This large master suite, situated on the third floor, faces west. Overlooking a secluded view of wooded landscape, the soft light of the setting sun is welcomed. This interior design project focused on a window treatment presentation that would also allow as much natural light to enter the master suite during the day. The soft shade of the chandelier provides just enough light in the evening hours to highlight the room’s custom drapery and design elements. The window treatment around the large double window is an inverted, pleated floating panel. These and two bedside floating drapery panels have been finished with a cream colored silk fabric, allowing length in the panels to puddle on the floor. This particular presentation uses custom drapes that are scrunched, hiding the rod run treatment. The complimenting wall paint creates a lovely pairing with the cream colored silk panels. To add some striking contrast to the soft colors, a dark colored headboard and side tables were chosen. The bedding is simple yet elegant, including the finer details of colored buttons and matching trim piped along the bedspread edges. Master suites are one of favorite rooms to work on with my clients. I have particularly enjoyed designing lovely upholstered headboards for many of my clients. Interior designers may not always offer this service and this detail is often overlooked. I always try to encourage my clients to see the possibilities, including small details that make the design complete. While a window treatment may be needed in the space, not every client enjoys the look of custom drapery. When I have clients who are not crazy about dressing a window with a lot of fabric, I like to suggest wooden shutters, like those featured here in this master suite. These large, wooden, one piece shutters have nice, clean lines and are functional for letting light in and out of this sized room, and add privacy. This wall color is so inviting for sleep without reducing the natural light of the day while the shutters are open! One of my favorite interior design pallet choices for master suite wall coloring is Sherwin Williams - Rock Candy. These roman shades play on the colors of the room by including a subtle touch of a small trim that compliments the colors of the walls and rug! Beautiful details!! For an interior design project like this, I often suggest silk roman shades for side the windows to compliment the French door window treatment. They go beautifully with the panels and the at mounted inside the windows to allow the gorgeous window trim to be seen. The fabric color compliments the rug which frames this king bed! Interior designers have their favorites and 'dupioni' silk panels are on my short list when it comes to window treatments for master suits. The look is classic beauty! Seen here are rich taupe colored panels, interlined to block out the light for room darkening -- a request of most of my clients. Attached with large wooden rings, these pinch pleat panels are easy to pull across the rod selection that matches the wood of the king bed! A large silk tassel easily holds the drapes back during the daytime. ‘Morning Violet’ wall color is perfect for a large scale room such as this, highlighted with all of the natural light streaming. At night, the color transitions with the large chandelier’s dimming options and appears to look the night sky. Adding elements that encourage relaxation and comfort are always a must that I suggest to my clients in a master suite.